One of the most difficult aspects of trend following for inexperienced traders to accept is that you never get out at the extreme of a price move, and that there is always an element of 'giving back' a portion of open profits before an exit signal is given. Generally speaking, the longer-term the trends you are trying to capture, the more wiggle-room your trailing stops need to give to current price action - this is to ensure that you are not stopped out due to a relatively minor retracement or price noise. When starting to trade a new method or parameters, even if you have may be got the confidence of decent back testing results, there is still the big step into the unknown when it comes to dealing with the psychological element of letting profits evaporate when you have real money in the game. This was brought home to me recently when discussing a long-term trend following system with an aspiring trend follower. 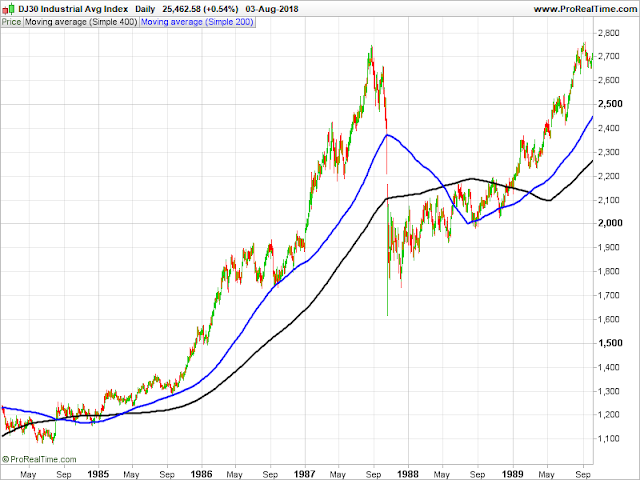 The basic method he was going to attempt to use was based simply on the 200 and 400 day moving average crossover, with a multiple of ATR used to calculate his initial stop distance. 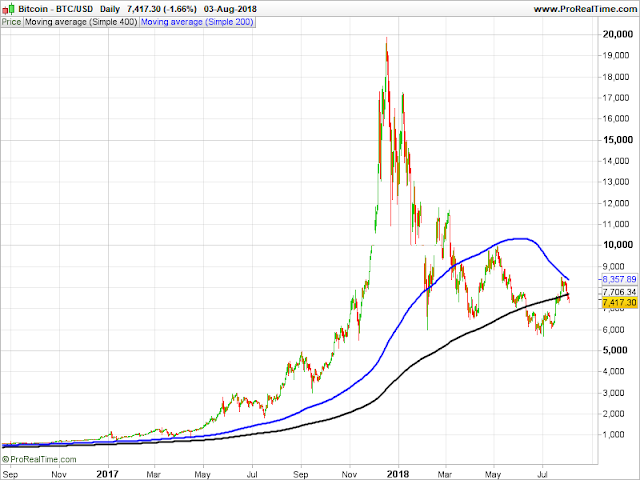 Here is the current chart of Bitcoin, with those two moving averages overlaid. The last moving average crossover actually occurred in late 2015, when price was around the 450(!) level. If you assume an initial 5ATR stop, then that would have been placed at around the 325 level. Therefore, each unit of risk (1R) would equate to 125 points. Now, as we all know, Bitcoin peaked at close to 20,000 last December. At the absolute extreme of the move, if you had the patience and discipline to keep holding your position for those two years, your profit would have (approximately) equated to something like +155R. But the interesting bit relates to what has happened since then. The subsequent price drop to price back to below the 6,000 level would have meant that open profits would have dropped to below +44R - still a handsome profit for sure, but a whopping 110R less than when the open profit was at its greatest! When teaching the Turtle traders, Richard Dennis told them to accept that they could easily lose 100% of their open profits - following the process was more important to him than the profit on any one individual trade. As he saw it, if your trading rules got you into a new position, then it also should be your trading rules that would get you out of the position. Famously, the heating oil trade during their initial training period showed that (at least to begin with) the majority of the Turtles did not follow the rules they were given. Going back to our Bitcoin example, at no point since the entry in late 2015 have the two MA's crossed back over, meaning that, based on his rules, no exit signal has been generated. So the big question I left with my trader friend to mull over was, from a psychological point of view, could he cope with an erosion of open profits of that magnitude? As another example, look at the chart of the Dow with the same moving averages plotted - two profitable signals and one small losing signal given since 2010! But the latest signal in the second half of 2016 would have meant having to sit through all the volatility and the sharp price drop earlier this year. And if you go back far enough in time, the 1987 stock market crash didn't trigger an exit signal on the Dow (shown below) - that came in April the following year, so again that type of long-term moving average crossover system would have meant sitting through Black Monday. Was it a hypothetical question I gave my friend? Absolutely, because until you are actually confronted with that type of situation nobody would actually know how they would react. But it is these "well chosen examples" which we can learn from, and possibly adopt additional rules (such as how to control your level of open risk) which will help you deal with similar future situations. Whatever rules you employ, traders who use a rules-based approach know at all times what they should do, but it is whether they can follow those rules when under pressure that is important - even if that potentially means giving away a big chunk of open profit.